It has been awhile since I read a WWII novel, as I do try to limit how often I pick them up. The time period is a popular one and I don't want to become inured to the stories, and I also want to mitigate the amount of melancholy in my reading, as I tend to get this way when reading about the war. I barely skimmed the blurb on this when I requested it last month and just dove in without expectations. News of Our Loved Ones was a lovely, quiet and yet powerful book. I enjoy novels with multiple narrators, and DeWitt employed the voices of the many characters to great effect. Each time the point of view was changed, I had a satisfying moment of clarity about one or more of the other character's motivations, each more enlightening than the last. Sometimes it became a little confusing, especially the chapter written in alternating second person narrative of a Nazi German and French Resistance operative. Yet, by the end of this short volume, I felt as if I connected with each of their inner lives. Her economy of words at setting a scene, conveying a feeling, and describing a character was impressive. "More discussion would have struck her as ridiculous..." "She was so averse to waste of any kind- of words, time, money- that even the slenderness of her bones was a measure of her thrift." I couldn't help but feel as if the author had some sort of personal connection to the war, because the families and situations felt so unique and vivid. Alas, upon doing some research, I found that her own mother's home on the coast of Normandy was bombed on D-Day and her sister (the author's aunt) was killed, at only 16 years old. This connection absolutely comes through in her writing. 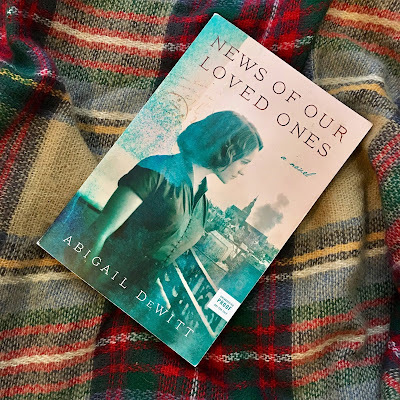 If you are a fan of WWII historical fiction, and methinks there are a few of you out there, I would highly recommend this quiet and beautiful character driven book. I found it a refreshing take on a subject written about often. Many, many thanks to the lovely folks at Harper for a complimentary advance copy in exchange for my honest review!